An outline of the main types of Arabic literature and their influence on European literature and a description of the main Arabic instruments and their subsequent development in Europe. Figure 1. Musicians and their musical instruments. Topkapi Palace Museum Library, H. 2164. Any discussion of Arabic literature must begin with the language itself. While the leading literary figures within the Islamic Empire represented a diversity of ethnic and cultural backgrounds, the non-Arabs among them adopted the language of the Qur'an as their universal medium of expression. Arabs have long considered their language a perfect instrument of precision, clarity and eloquence, as evidenced by the Qur'an itself and by subsequent literary masterpieces. Since the Qur'an was adopted as the fixed standard, a surprisingly vast and rich literature has accumulated over a period of fourteen hundred years. The earliest known form of Arabic literature is the heroic poetry of the noble tribes of pre-Islamic Arabia. It was there that the standard Arabic verse form, the qasidah, evolved. The qasidah, a long poem, often recounted incidents from the poet's own life or that of his tribe sometimes dramatically and sometimes, with a distinctively epic flavour. Pre-Islamic poetry was transmitted and preserved orally until the latter part of the seventh century CE when the Arab scholars undertook a great effort to collect and record verses and shorter compositions that had survived in the memories of professional reciters. During the Umayyad period (661-750 CE), the Arab way of life began to shift from a nomadic mode of existence to a more settled and sophisticated urban style. In accordance with the Greek and Persian practices of the time, poetry was often accompanied by music performed by women. In time, the poetic form was simplified: the complex and highly refined meters of the traditional Arabian poetry were replaced by shorter, freer meters which were adaptable to music. Poetry and music became inseparable, giving rise to the ghazal traditions, most strikingly illustrated in the famous Kitab al-Aghani, or "Book of Songs." Arab literature flourished under the Abbasids, who rose to power in Baghdad in the mid-eighth century. The "golden age" of Islamic culture and commerce reached its zenith during the reigns of Harun al-Rashid and his son, al-Ma'mun. Arabic prose began to take its rightful place beside poetry; secular literature was at home by the side of religious tracts. Abbasid authors of this era not only contributed to the splendour of their age but also left an indelible mark on the European Renaissance. The genius of Arab prose at that time was Abu 'Uthman 'Umar bin Bahr al-Jahiz (776-869), the grandson of a black slave who, having received a wide education in Basra, Iraq, became one of the period's leading intellectuals. Al-Jahiz is best known for his Kitab al-Hayawan, "Book of Animals," an anthology of animal anecdotes, representing a curious blend of fact and fiction. His Kitab al-Bukhala, "Book of Misers," a witty and insightful study of human psychology, is more revealing of Arab character and society than any other book of the time. The essays of al-Jahiz form a part of the large category of adab, polite literature or belles-lettres,. In the second half of the tenth century, a new literary genre appeared. This was known as maqamat "assemblies" - amusing anecdotes narrated by a vagabond who made his living by his wits. The maqamat were invented by Badi' al-Zaman al-Hamadhani (d.1008); only fifty-two of his original four hundred maqamat have survived. Al-Hariri (d. 1122) elaborated upon this genre and stereotyped it, using the same format and inventing his own narrator and roguish hero. The popularity of the maqamat was only eclipsed by the rise of modern Arabic. For many people, Abu al-Tayyib Ahmad al-Mutanabbi, may have been the greatest of all Arab poets. Born in Kufa, Iraq, and educated in Syria, al-Mutanabbi appeared in the early part of the tenth century. His themes recalled the traditional Arab virtues of loyalty, honour, friendship, bravery, and chivalry. The last great poet of the Abbasid period was Abu al-'Ala al-Ma'arri (973-1057). While al-Ma'arri's poetry reflects the pessimism and scepticism of his particular era, he nevertheless transcended his age to become one of the major figures of Arabic literature, as well as a special favourite of Western scholars. Towards the end of the ninth century, history began to form a part of belles-lettres. The necessity for collections of data on the countries of the Abbasid Empire stimulated geographical writing, mixed with travellers' observations and tales of marvels. Idrisi, in twelfth century Sicily, was commissioned to compile the Book of Roger for the Norman King of Palermo, with accompanying maps. Yaqut (d. 1229) wrote a large geographical dictionary, gleaned from many sources. The basis of Arabic writings of history was provided by accounts of the life of the Prophet Muhammad. Since the compilation of such biographies was determined by the Arab system of isnad that is, of quoting all available authorities and establishing their reliability, Arab history-writing was generally characterized by accuracy rather than by creative handling or interpretation of available materials. It, thus, provides the modern historian with a most accurate and comprehensive source of material. The Arabs also produced the man whom modern scholars consider the true father of modern historiography and of the science of sociology Ibn Khaldun (d. 1406). A native of Tunisia, a government official at the Arab courts of Granada, Morocco and Algeria, Ibn Khaldun became the chief justice of the Mamluk sultans of Egypt. It was in the Maghreb, before settling in the Middle East, that he spent several years in retreat composing his great work: Muqaddimah. While before Ibn Khaldun, historiography was concerned mainly with rulers, battles and straightforward accounts of main events, this great Arab thinker was the first to recognize that events did not happen in a vacuum but depended upon an endless variety of factors previously neglected by historians, such as climate, social customs, food, superstitions and so on. Thus, in his Muqaddimah, he deals extensively with subjects such as the nature of society and occupation, labour conditions, climate and methods of education. Modern scholarship acknowledges that, thanks to him, latter-day historiography changed fundamentally. Of his truly revolutionary work Arnold Toynbee wrote, "Ibn Khaldun has conceived and formulated a philosophy of history which is undoubtedly the greatest work of its kind that has ever yet been created by any mind in any time." In a similar vein, Professor George Sarton has said of the Muqaddimah "I do not hesitate to call it the most important historical work of the Middle Ages." No Western author expressed Europe's fascination with any aspect of Arabism in a more dramatic and poetic form than did Shakespeare. Among his most attractive characters, two are Arabs, or as he calls them, "Moors": Othello, from the play of the same name and the Prince of Morocco, one of the noblest figures in The Merchant of Venice. The prince, modelled on the great Sultan Ahmed al-Mansur, shows a royal dignity expressed in words of great nobility. Whereas the Prince of Morocco is only a minor character in The Merchant of Venice, Othello completely dominates the drama to which his name is given. A man of unbounded passion, this Moor "who comes from a land of deserts, rocks and hills whose heads touch heaven" (a reference to the Atlas Mountains) is also a paragon of loyalty, courage, honesty, and possessed of a nobility rendered more striking by contrast with the infamy of the "white" Iago. To the present day, experts acquainted with the Moorish character are amazed at the insight with which Shakespeare created Othello. In the London of Queen Elizabeth I, Morocco was very much "in the news." Among the founders of the "Barbary Company," an association of London merchants trading with Morocco, we find the Earl of Leicester, one of the Bard's patrons. It was from his many Barbary-merchant friends that Shakespeare obtained much information of Morocco and its people. Altogether we find more than sixty references to Barbary (Morocco) in Shakespeare's plays. Shakespeare was by no means alone in falling under the spell of Moorish subjects. In his Tamburlaine the Great of 1587, Christopher Marlowe introduces the "Kings of Morocco and Fez." A year later a certain Ed. White published A Brief Rehearsal of the Bloody Battle of Barbary; in 1594, George Peel's play, The Battle of Alcazar, was produced in London; and, shortly afterwards, an anonymous author, Ro. C. published a history of Morocco entitled, A True Discourse of Muley Hamet's Death. The Oriental fashion, in which Arab elements were often confused with Persian and Indian, persisted throughout most of the nineteenth century when Victor Hugo could write: "In the age of Louis XIV all the world was Hellenistic; now it is Orientalist" (Preface to Les Orientales). While The Thousand and One Nights did not alone create this romantic flood, it greatly widened the scope of European literature and enriched its imagery and language, producing a focus for Europe's yearning for the exotic and stimulating latent interests among its intellectuals. Arabic literature, in addition, to being the crowning artistic and intellectual achievement of the Arabs, also represents one of their most enduring legacies to the West. It is an aspect of the Arab heritage which, though often neglected or given only cursory attention, offers important insights that provide a fuller understanding of Arab culture and its contributions. We find Arab names and settings in the famous Aucassin et Nicolette and Arab echoes even in Boccacio's Decameron. Chaucer's Squires Tales uses a theme brought to Europe by Italian merchants who had traded in the Middle East. And, of course, there is the most famous medieval work of literature, Dante's Divine Comedy, replete with details from the story of the Prophet Muhammad's ascension to heaven and details culled from the Meccan Revolution by the great Arab mystic Ibn Arabi. Perhaps no work of Arabic literature has stirred Western imagination as much as The Thousand and One Nights, popularly known as The Arabian Nights. A collection of separate stories exciting, romantic, amusing and always highly entertaining the book has Arab, Greek, Persian and Indian origins. It was finally compiled and unified by Arab authors in the tenth century, giving it an entirely Arab character, placing its two main centres in Baghdad and Cairo. At times, with the salty humour of true folk tales and always with an astounding inventiveness, the book enjoyed a great popularity throughout the Middle East where it was known chiefly through oral transmission by professional storytellers. Its popularity with the European public, however, was infinitely greater. The first translation by the Frenchman Galland, in 1704, was soon followed by English versions. Their success was spectacular, and new editions followed one another in the manner of modern best-sellers. The astounding popularity that The Thousand and One Nights enjoyed in Europe from the start can be traced to the "oriental" yearnings that had been growing among Western writers, artists and readers ever since the days of the Crusades. The public found in these tales an element of romance and adventure that was missing from European literature. To be sure, The Thousand and One Nights was partly responsible for the composition of European novels as famous as Robinson Crusoe and Gulliver's Travels. Arabism, or "Orientalism," as it was usually called, provided Western writers with a wealth of new themes. We find such themes in Samuel Joh's Rasselas, in Byron, in the satires of Voltaire, and, of the French reformers, in Beckford's Vathek, in Germany, in Goethe's famous Westoestlicher Diwan, and in Rukert and Platen-Hallermund. The identifying mark of a people may be found not only in their language, but also in their music. Throughout their long and illustrious history, the Arabs have been lovers of music in its various forms. Music is an integral part of daily life in the Arab world and sensibility to its sounds and tones is deeply rooted in the Arab personality. Musical tradition in the Arab world is very old, dating back to the simple sing-song recitations of tribal bards in pre-Islamic days, usually accompanied by the rababa, a primitive two-string fiddle. As they spread out into the Middle East and North Africa in the seventh and eighth centuries CE., the Arabs quickly added the rich and complicated scales and tones of Indian, Persian and Byzantine music and developed a unique form that has persisted to this day with only minor changes. Figure 2. 18th century manuscript on musical composition and rhythm showing a rababah. Topkapi Palace Museum Library, H 1793. In that sense, Arabic music is a remarkably enduring art form which, after centuries of competing cultural influences, has retained an overall unity. Many of its sounds are alien to Western ears, but the melodies have great emotive power for Arabs who can recognize the variations in musical styles, from the famous maqaam of Iraq to the , a form of singing developed in Arab Spain during the Middle Ages and still used today. 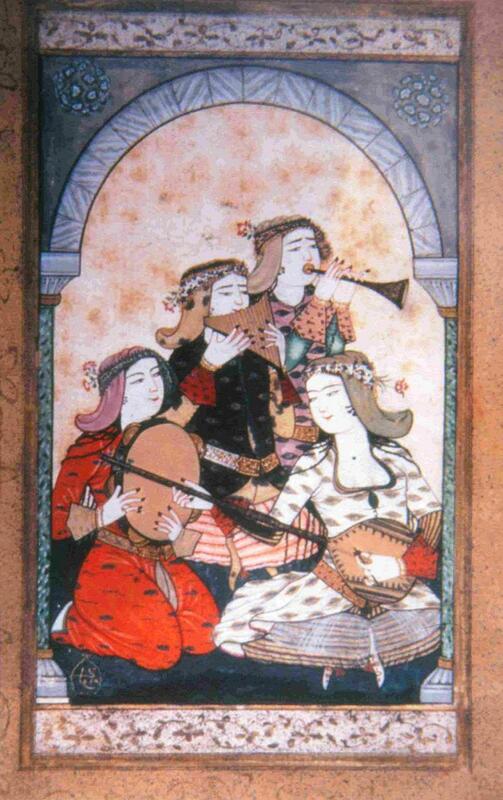 For several centuries, Arab rulers from Baghdad to Cordoba were famed for their patronage of music and musicians. Their courts boasted full orchestras for entertainment, while noted musicians competed for the ruler's favour. The music of the Arabs gradually influenced the West. Masters such as Bartok and Stravinsky composed works with detectable Eastern or Arabic influences. The Western world inherited not only the structure and tabulation of Arab music but also many of its instruments. takhet (orchestra) is the 'oud. It has a half pear-shaped body with stripes on its shell and a right angle keyboard. It has twelve strings (six pairs) and is played with a plectrum, often the sharpened quill of an eagle. The word 'oud comes from the Arabic word meaning wood. This instrument has a long history. Pictures of 'oud-like instruments have been discovered on stone carvings in ancient Egypt and Mesopotamia. Persians and Indians played it in ancient days. It was the Arabs, however, who perfected the 'oud, gave it its name, and passed it on to the Western world. The 'oud reached Europe during the Middle Ages to replace a plucked instrument, the gittern. In Italy, the 'oud became il luto, in Germany, laute, in France, le luth, and in England, the lute. 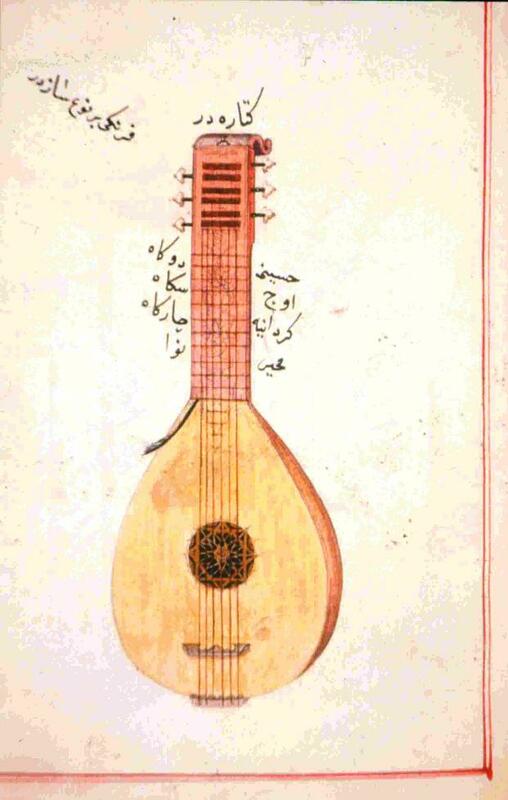 As music became more complex with the introduction of chord patterns in the thirteenth century, alterations in the technique of playing the 'oud as well as modifications in its construction were applied. These changes brought its sound close to that of the vihula, a form of Spanish guitar. In the sixteenth and seventeenth centuries, the 'oud was very popular in Europe as a solo instrument and as a part of orchestra ensembles. By the middle of the eighteenth century, the lute's rival, the guitar, which was simpler in construction and less cumbersome to hold and to play, finally won the battle for popular favour. Other instruments which developed from the 'oud are the mandolin, the mandora, panadurina, theorbo, chitarrone and mandolino. The mandolin enjoyed its golden age in the eighteenth and early nineteenth centuries when works for it were written by Vivaldi, Handel, Mozart and Beethoven. 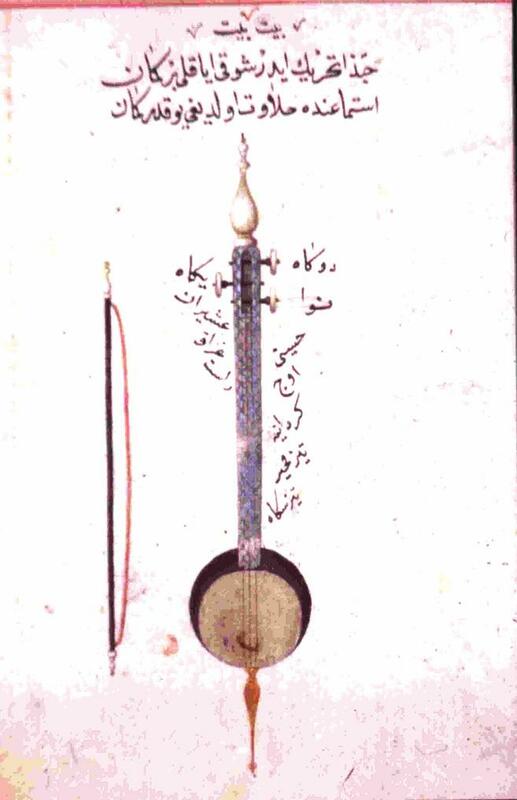 Another instrument developed by the Islamic world and passed on to Europe is the tanbour or the buzuk. This instrument has a small pear-shaped body and long gut-fretted neck. Its shape required the player to have a far greater dexterity than was required for performing the 'oud. In Italy, it was transformed into the calscione and is still used in most of the Balkan countries as a folk instrument. In Yugoslavia, it became tanburitzza, in Greece, the buzuki, and in Russia, the domras. The qanoon, zither, was first developed in the Arab world during the tenth century. It is a flat trapezoidal wooden box, with twenty-four strings in triple fastened at its rectangular side on one end and to pegs on the oblique side on the other. Small levels lying below each course of strings are manipulated by the player to make slight changes in pitch. The strings are plucked with two horn plectra, one on each index finger. The qanoon is believed to have been invented by al-Farabi, the Muslim mathematician, physicist and musician. From Spain it was introduced to Europe. It retained its original name and shape until the fifteenth century. In Europe, it was the psaltery, in Russia, gusli, in the Ukraine, bandura. The Latin name was canon, the Italian, canone, the German, kanon, the Scandinavian, kanala, and the French, micanon. As early as the twelfth century, a new Islamic instrument, very similar to the qanoon, was introduced to Europe through Byzantium. The santur, as it originated, or the dulcimer, as it was named by medieval Europe, is struck rather than plucked. In Greece it was known as the santuri and in Rumania and Hungary it evolved as the cembalom. The rabab, or "rabe morisco" one of the contributory ancestors of the violin also spread from Spain to Europe under the name rebec. It is a violin-like instrument except that it is played vertically, mostly by street musicians. The last Arab instrument to be adapted by the Western world is the tambourine - a percussion instrument used to provide rhythm. The tambourine is made of wood and parchment with pairs of small brass cymbals attached around its circular frame. It is held by its frame with the thumb of the left hand on one side and the rest of the fingers extended on the other side of the skin. It is still enjoyed in many countries, especially in Spain.